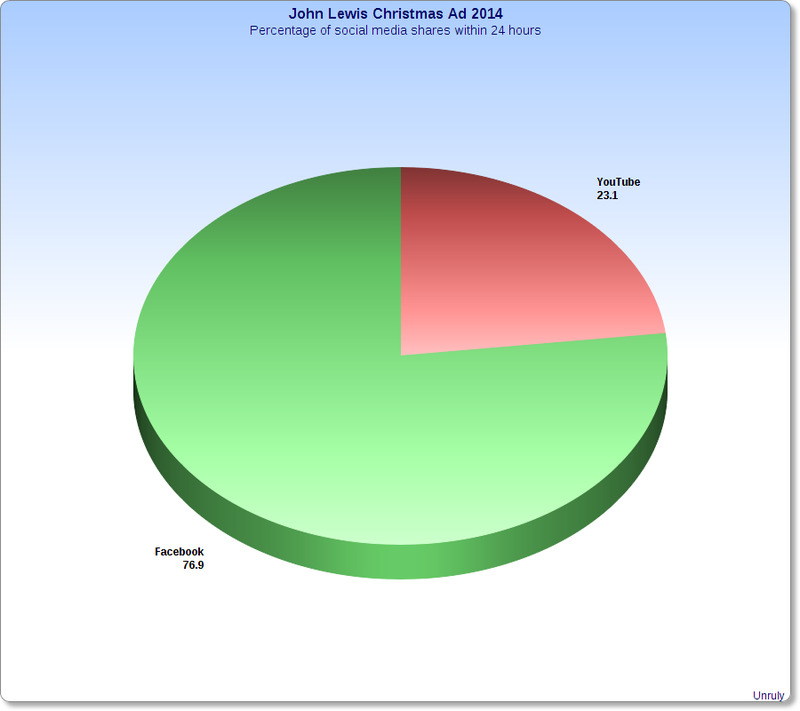 John LewisThe John Lewis 2014 Christmas ad was shared more than 200,000 times in its first 24 hours online. It has not even aired on TV yet, but John Lewis’ latest Christmas ad is already huge sensation. 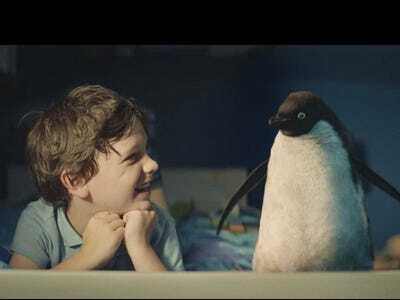 It is always a huge annual event in the UK — the retailer treats it like a Super Bowl commercial — but this year’s tale of a boy arranging a mail-order love match for his toy penguin friend has gone bigger online than any of John Lewis’ previous festive efforts on their first day. Why? It looks like Facebook video has given the UK department store an extra helping hand. Stats show Facebook has stolen 40% of the online audience for the video, which would previously have belonged entirely to YouTube. 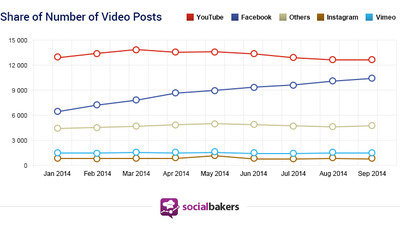 The shift is dramatic: Until very recently, Facebook was simply not a destination for video. Now, the social network is slicing off large chunks of YouTube’s business for itself. As of 9 a.m. Friday, just over 24 hours after John Lewis unleashed its latest holiday campaign on the internet, the video had been shared 202,953 times across social media, according to data from social video marketing company Unruly. At the same point last year, John Lewis’ 2013 “Bear and the Hare” ad had 198,244 shares. That might not seem like a massive leap, but what’s interesting is that last year John Lewis didn’t upload its Christmas ad direct to Facebook, it just shared the YouTube link. 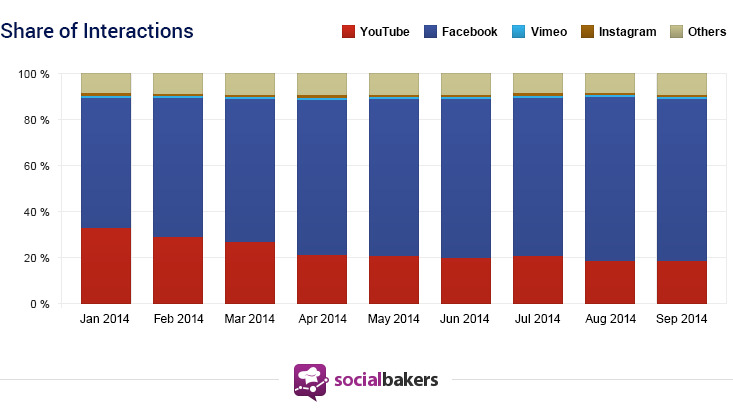 YouTube still dominated in terms of views — 4.1 million views to Facebook’s 2.8 million views. But even so, that still means 40% of John Lewis’ views are now on Facebook, when last year there was none. This time around, Facebook is actually dominating in terms of social media shares. As of 9 a.m. Friday, the Facebook video had been shared 156,063 times, while the YouTube video had only been shared 46,890 times. So Facebook attracted 76.9% of the shares in the first 24 hours. And for marketers, sharing is a far more important engagement metric than a view. If someone shares a video it’s a sign of endorsement; something they’d be proud to be associated with (even if they’re criticising the video in their comments, the fact that a video has elicited some sort of emotional response is still a bonus for a marketer), rather than just passively viewing something. So the fact that 5.66% of the people that watched the video on Facebook went on to share it on social media, compared with 1.14% of YouTube viewers, is likely to speak volumes to John Lewis about where it should prioritise placing its next piece of video content: Facebook. If early stats on the John Lewis Christmas ad are not enough to convince marketers of the power of Facebook video, last month researchers at Socialbakers found content creators were migrating from YouTube to Facebook in their droves. 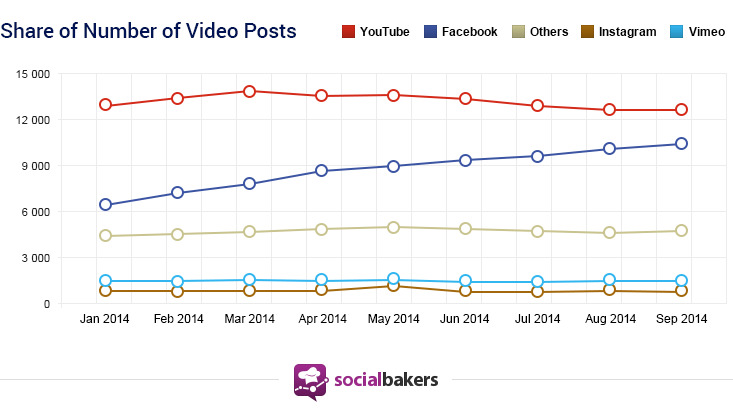 YouTube’s share of the number of video posts has dwindled throughout 2014, while Facebook’s share is on an upward trajectory. Similar patterns have also followed for the share of video interactions. In September The Wall Street Journal reported that Facebook was trying to poach some of YouTube’s hottest stars in a bid to get them to publish direct to Facebook and take a cut of some of the associated advertising revenue. It has been made very clear in recent months that Facebook is placing video at the heart of its growth strategy, having announced in September that since June this year its platform achieved more than 1 billion video views each day. Facebook currently has only a modest video advertising business, having only launched its first video advertising product in December last year. Facebook has repeatedly insisted that it wants to roll out autoplay video ads “deliberately slowly” to get users used to the idea of them appearing in the News Feed, rather than overloading them with content from brands right away. But while video advertising makes up just a small chunk of its advertising revenue currently, organic video is key to building engagement on Facebook. The more time users spend on the platform, the more valuable those users are to advertisers. More ads can be served to them and the price of Facebook advertising goes up. Result. That’s not to discount YouTube. It is still, by far, the biggest video platform, with a 73% share of the US visits to multimedia portals (ahead of Netflix with 5.6% and Bing videos with 3.3%), according to Statista. Its owner Google is also increasingly using the same method TV broadcasters use — upfronts — to secure major upfront advertising commitments for YouTube.